Although the degree is the chief unit used to measure an angle in elementary mathematics courses, the radian has several advantages in more advanced mathematics. A radian is one radius length. The circle shown in the figure below has radius r. The circumference of this circle is 360°, or 2π radians, so one radian is . Although R is used to indicate radians, a radian actually has no units, so the use of R is optional. 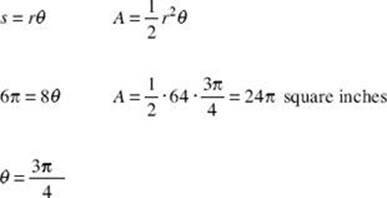 (A) To change degrees to radians multiply by , so 30° = 30° . In a circle of radius r inches with an arc subtended by a central angle of measured in radians, two important formulas can be derived. 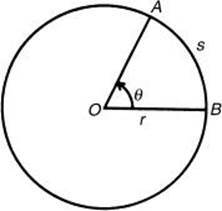 The length of the arc, s, is equal to r , and the area of the sector, AOB, is equal to . 2. Find the area of the sector and the length of the arc subtended by a central angle of radians in a circle whose radius is 6 inches. 3. In a circle of radius 8 inches, find the area of the sector whose arc length is 6π inches. 4. 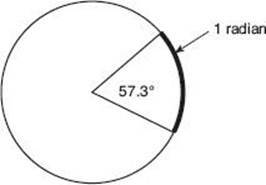 Find the length of the radius of a circle in which a central angle of 60° subtends an arc of length 8π inches. 1. An angle of 30 radians is equal to how many degrees? 2. If a sector of a circle has an arc length of 2π inches and an area of 6π square inches, what is the length of the radius of the circle? 4. A central angle of 40° in a circle of radius 1 inch intercepts an arc whose length is s. Find s.
5. The pendulum on a clock swings through an angle of 25°, and the tip sweeps out an arc of 12 inches. How long is the pendulum?